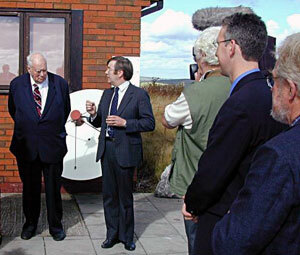 On 29 September 2001 the Spaceguard Centre, the first establishment of its type in the country, was opened by Sir Patrick Moore CBE in the presence of a host of eminent astronomers, national and local politicians, friends, family and, of course, the media. 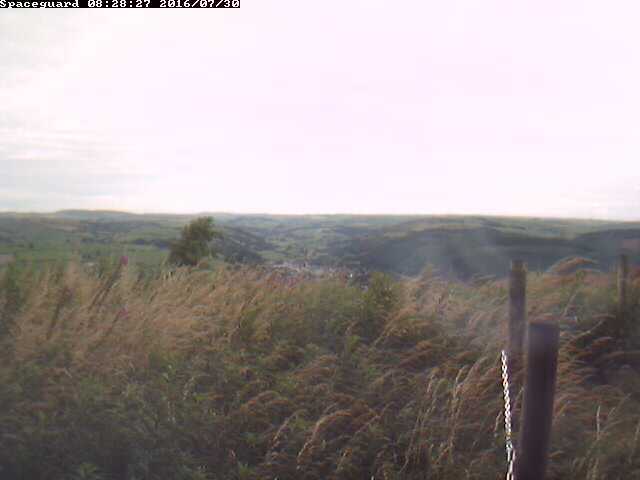 The weather was superb, and the guests were treated to the magnificent views of central Wales and the Midlands from the observatory while not inspecting the equipment and exhibitions inside. Thanks go to Dr Harry Atkinson, David A. Hardy and Andrew Thompson for generously allowing us to use the photographs below. The party gathers. In the group to the right are Professor Mark Bailey, the director of the Armagh Observatory, Professor Bill Napier from Cardiff University, Dr Duncan Steel from Salford University and Dr Benny Peiser from Liverpool John Moores University. 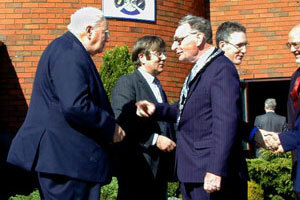 Sir Patrick meets the Mayor of Knighton, Councillor Roger Bright. 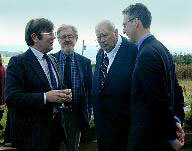 Jay Tate, the Centre’s director, chats to Patrick Moore, Dr Harry Atkinson (the chairman of the government’s NEO Task Force) and Lembit Opik MP. 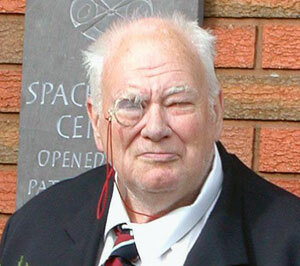 Jay Tate invites Sir Patrick to “do the honours”.